Lake Level; Demopolis Lake could be down in early Fall, due to summer drought. Fall rains in Oct – Nov. can suddenly swell the lake to full pool. Water Temperature; Varies as waters cool each month – Late Summer into early Sept.- 90 degrees. Sept. – Oct. water cools, from 80 degrees to 60′s. Water temps could be in the low-to-mid 50′s by late November, with early winter cold fronts. Anglers planning on fishing Alabama’s Demopolis lake on the Warrior River / Tombigbee River systems this Fall season can plan on going through several stages as Fall progress…just like the bass their seeking. 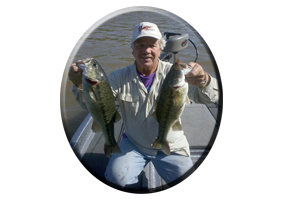 As the waters of Demopolis Lake begin the slow, cooling down process (a period lasting right on into the month of December), each month shows the lake’s vast population of bass making a mass migration towards the shallows. 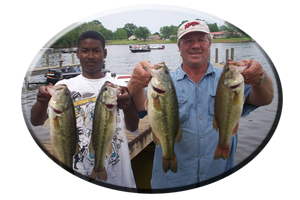 So do Demopolis lakes baitfish like minnows, various breeds of shad, sunfish, bream and crappie. As always there are plenty of other tempting meals for these bass to dine on. Like frogs, small bank-running rodents, snakes, worms, lizards, insects and loads of crayfish. 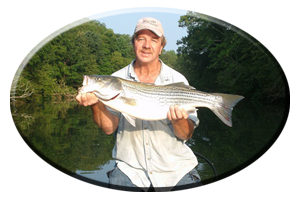 The predators that seek them, the Alabama spotted bass and the largemouth bass – are always close by. Most of Alabama’s hot summer seasons traditionally drag on into September and it can still be in the low 90′s later in the month. As Fall officially gets underway water temperatures are always slow to cool down, with early Fall’s hot days and mild nights still unseasonably warm. Water temps may only cool into the low 70′s by late October. But that’s just enough to send Demopolis lake’s bass on a feeding frenzy, as they head towards the shallows and begin to feed and fatten up for the cold, Winter months ahead. Its all about cold fronts. Most of Alabama’s anglers have not even heard those dreaded words in the past few months. 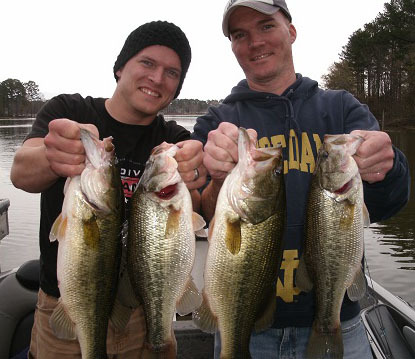 Cold fronts can actually help improve the fishing or it can suddenly hurt the fishing. So like most fishing trips, timing is everything. Planning your trips to this south Alabama impoundment accordingly can reap huge rewards. Poor planning, can send an angler home early with nothing but a huge gas bill to show for his / her efforts. Cold fronts are actually a welcome sight during the early part of the fall season. Waters have been stagnant, hot and slow to cool at summer’s end. One or two cold front days, coupled with an even colder night or two, can suddenly drop Demopolis lakes water temps as much as 10 degrees. The next warming trend following this first major cold front of the fall season, usually displays clouds and incoming fall rains. These conditions can really turn these Demopolis lake bass on for a few days. On the other hand, anglers visiting the lake as another cold front arrives, just after this rainy front, will have to face bright, bluebird days. Conditions that are tough for finding cooperating bass during any season. So like said, ” timing is important ” to successfully enjoy a day with fish-catching success. Of course a Saturday bass tournament cannot be planned for and often an angler will just have to adjust…like the bass they are after! Shallow Backwaters or Main Lake? Given the choice, most anglers will choose to fish shallow waters, casting their tempting offerings towards the many visible targets found in Demopolis lake’s shallow backwaters. And rightfully so. This is a very fishy-looking lake! There are plenty of types of aquatic weeds, all kinds of wood cover like stumps, logs, laying trees, brush piles, piers and boat houses. There are also plenty of backwater Cyprus trees and bass that have all kinds of cover to choose from, when hiding in wait for the many passer-by meals found in Demopolis lake’s shallows. So with plenty of cover and loads of meals to choose from, these bass have no reason to be in deep water, like found on the main lake. Although its been said, ” fish the creeks in the Fall”, there can be times when an angler must fish the main lake. Low water in the early Fall season, when the lake is down 4-5 feet, can prevent an angler from even getting a bass boat in most backwaters. 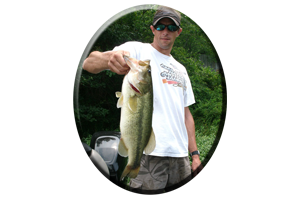 Again, bass and bass anglers alike must then choose deeper, main lake waters. Cold fronts can send these bass to the deep and they can abandon the shallows with several consecutive cold days and nights. 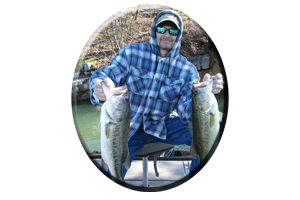 Fishing Demopolis Lake this Fall season gives way to many decisions, on the part of the dedicated angler that wants to catch fish. Lure choice, the places you fish and choosing the right days to be on the water, can help determine your success.